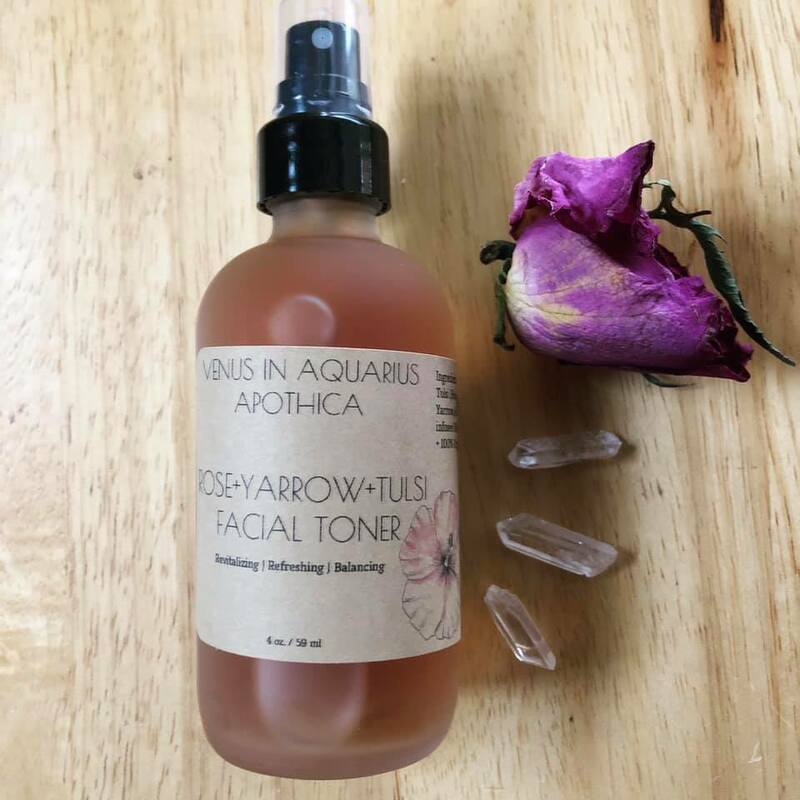 Based out of Cleveland, Ohio, Venus In Aquarius Apothica specializes in Astrological Aromatherapy, and a variety of plant based products for the mind, body, and spirit. We interviewed owner Samantha Phillips to learn more about her local business. My name is Samantha Phillips and I run Venus In Aquarius Apothica, which is located in Cleveland Ohio. The business specializes in Astrological Aromatherapy, and a variety of plant based products for mind, body, and spirit. The mission behind my business and what inspired me to launch was an internal pull to our natural world and inspiration by something much larger than us. My intention is to create products that encourage and inspire you along your own journey of self love and self discovery, while developing a deeper connection with the earth and its plant allies. My craft was originally a down time hobby that I had for years. The original inspiration behind my business was an emphasis on astrological themed products. Following this path opened my eyes to herbal medicine and herbalism; which is something that is deeply embedded in all of us. Hands down my favorite thing is my Astrological Aromatherapy Blends. They are the backbone and main inspiration behind my business and what I do. Creating the blends for these was a sacred time for me. For as long as I can remember, I wanted to be a Dietitian. I remember being hyper vigilant about healthy foods/unhealthy foods growing up. When I went to college, I realized that the degree itself wasn’t as aligned with my core values as I was expecting. I graduated from Kent State University with a Bachelors of Science in Public Health. Though I believe the universe had me go down a different route; and I feel like I’m really living my truth as a student of herbal medicine. My creative process varies with the seasons. I like to make things during certain astrological phenomenons or moon phases. Most of my products consist of triple strained herbal infusions; which are dried herbs/flowers submerged in a carrier oil for 5-6 weeks. That way the herbs infuse and release their medicinal properties over time. My Body Oils, Facial Elixir, Cramp Elixir, Hair + Scalp Elixir, and Healing salves all consist of six week herbal infusions. All of my products are small or even micro batched. If I could tell my nineteen year old self anything; it would be to follow your bliss and not what society expects. To not take anything and everything too seriously, and that it definitely gets better over time. Supporting local artists and makers is so important because you’re supporting your community. You’re supporting someones life purpose and divine assignment, and you can personally say that you know who made the piece of art on your wall, the pair of earrings you’re wearing, your favorite mug, etc. There is a soul and story behind the work. It’s a connection that buying at a big box store or amazon doesn’t have. I love what I do because it sparks joy within my soul. I’m constantly learning so much about myself and am still a forever student in my craft. Its like i'm growing personally with my business. I also love the connections and friends I have made by being in this creative community. My advice would be to not wait until everything is “perfect”. Start now, and learn as you go. Also to start with an open mind and open heart. There is always something new to see and do in Ohio. I have lived here all of my life, and there are still places I haven’t explored or have discovered yet. Especially when it comes to the outdoors.